An organization that advocates for higher wages for Walmart employees said Thursday it plans to stage a fast starting 15 days before Black Friday. The effort by "Our Walmart" has been dubbed Fast for 15 as a play on the name of the Fight for 15 movement, which demands a minimum wage of $15 an hour. Participants in the fast, which begins Friday, will include current and former Walmart employees and concerned citizens. So far over 100 current Walmart employees and more than 900 others have signed up. The protesters have pledged to fast for varying numbers of days -- only some will attempt to go all 15 days, according to the group. A core group of fasters will consume only liquids. Fasts will also be held at the homes of Walmart heirs. The first is planned for November 16 to 20 in New York City near the home of Alice Walton. Another will be held on November 24 outside the California home of Walmart heir and chairman Greg Penner. The group also plans to fast outside some Walmart stores. The fast is particularly significant because many current and former Walmart associates complain they are unable to buy enough food to feed themselves and their families on their salaries. "There were days when employees had to choose between paying for gas to get home and eating lunch," Denise Barlage, a former Walmart employee, said on a call with reporters. Nancy Reynolds, who said she works at Walmart, cannot participate in the fast because she's diabetic. To show her support, she has started a petition to get Walmart to offer employees a 10% discount on food. "I often eat chicken fingers and milk for lunch -- it's not part of my [recommended] diet, but it's all I can afford," Reynolds said. 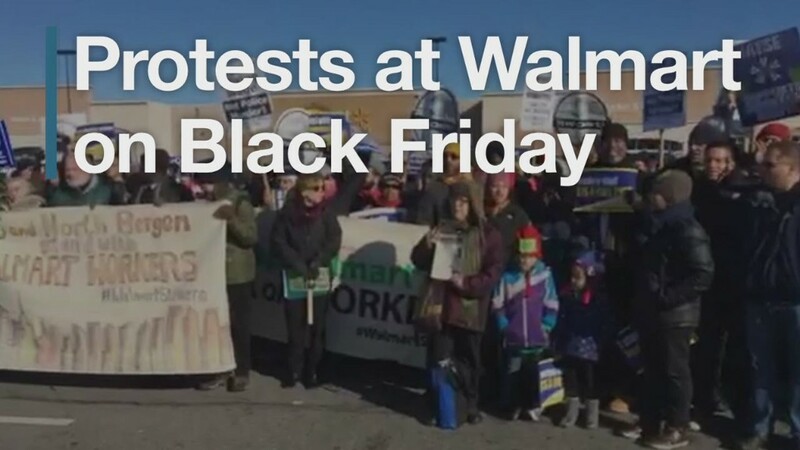 Black Friday protests at Walmart (WMT) are nothing new -- this is the fourth year in a row that unions and workers have gathered outside stores across the country to demand higher wages. Walmart this year was a leader among big employers to raise wages. In February, CEO Doug McMillon said the minimum wage for new employees would increase to $9 an hour in April and $10 an hour next year. He also hiked the pay of department managers, which will start at $13 an hour and go to $15 an hour by 2016. In October, Walmart blamed the wage increases for hurting its profits, causing shares to fall 10% to a 3-year low. Walmart responded to the announcement about the fast. It noted that it will spend $2.7 billion this year and next on wages and education programs for its workers. "False attacks and media stunts from the unions have become an annual tradition this time of year," Walmart said. Are you a current Walmart employee participating in the fast? Email ahiza.garcia@turner.com and you could be included in a CNNMoney article.